Leah Sharibu, the only Christian among theabducted 119 students of Government Girls Secondary School, Dapchi, Yobe state, has asked President Muhammadu Buhari to save her from captivity. 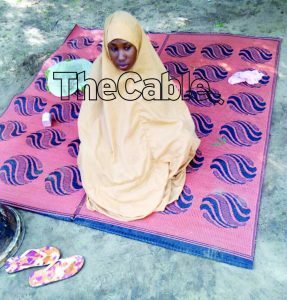 As a “proof of life” amidst speculations on her fate, TheCable has exclusively obtained her latest picture as well as the audio of her plea to Buhari. Clad in hijab, sewn from a light brown material and seated alone on a mat patterned in pink, Sharibu spoke with measured calmness. “I am Leah Sharibu, the girl that was abducted in GGSS Dapchi. I am calling on the government and people of goodwill to intervene to get me out of my current situation,” she said. Sources told TheCable that the audio as well as pictures were part of the proof of life requirement in a possible renewed negotiation efforts between the government and ISWAP members. Thereafter, according to our sources, the 110 Muslim schoolgirls were brought back under an elaborate ceremony that had the community cheering. Lai Mohammed, minister of information, and Lawal Daura, the sacked director-general of the Department of State Services (DSS), had said the release was part of a wider ceasefire talks with the insurgents. Recently, the release of the girls sparked a controversy when the UN said a heavy ransom was paid but Mohammed insisted that no dime was given to the insurgents in exchange for the release of the girls.